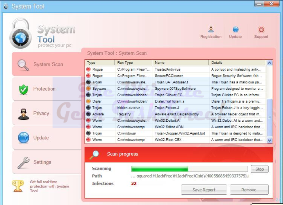 System Tool 2011 is another rogue (fake) antivirus program that appears as legit antivirus software. Once installed, usually via Trojans, this program is designed to automatically run false scans and display bogus security alerts, pop-ups, which disrupt the end-user’s overall computer-browsing experience. The sole purpose of this rogue antivirus program is to trick its victims into believing that their computers have been infected and thereby urging them to purchase the full version of the software in order to proceed with threat removal and protection. DO NOT fall for this kind of marketing tricks as doing so will result to total waste of your hard-earned money and exposure of your credit card to cybercriminals. If your computer has already been infected with System Tool 2011, get rid of it right away as failure to do so will result in getting your system disabled by this rogue antivirus software. Furthermore, System Tool 2011 is capable of changing your desktop wallpaper with its blue screened message warning about your computer being infected and your information being at risk. It will hijack and redirect your Internet Explorer or whatever web browser you are using, in order to have you purchase the program with your credit card. Again, please do not purchase System Tool 2011 as it will neither remove infections nor protect your computer in any way shape or form. Remove System Tool 2011 manually by restarting your computer in safe mode using F8 key. Use the built-in FIND or SEARCH utility to locate the files, folders, & processes related to System Tool 2011. Once found, delete all the items and empty the Recycle Bin. It is important to delete both the windows registry entries and the Prefetch folders which have been created by System Tool 2011. Remember to create a backup of the windows registry prior to doing so. System Tool 2011 can also be removed from your computer automatically by using antivirus software. You need an updated version of reputable antivirus software to remove the threats. Schedule your antivirus to perform complete scans and removal of all infections. If your computer has not been infected with System Tool 2011, avoidance is the best strategy to staying safe from this bogus software! When visiting websites, be careful on what you click on, especially ‘executable’ (.exe) files. Most rogue-ware will automatically launch installer-scripts when either an image or an executable file is clicked on. Once the software is installed onto your computer, it installs multiple instances of Trojans and Malware, such as Trojan.FakeAlert, that generates the alerts, Trojan.Downloader, Rogue.Installer, Fake.Beep.Sys, Disabled.SecurityCenter, Malware.Trace, and more. If you are unable to remove System Tool 2011, security pros are a click or call away! You may Google Remote Virus Removal to find the help you deserve. Adachi Computech Solutions is a global provider of remote computer support zone for computer support, where you can get the facility of fixing computer problems, pc repair, laptop repair, remote virus removal, computer maintenance repair on 1-866-607-2321. With AdachiCompuTech, you can also get computer repair service, windows 7 support, notebook repair, computer support, pc tune-up, virus removal support, computer repair New Jersey, computer repair Edison, computer repair Hawaii, Nationwide computer support from Microsoft certified computer specialists.